It is summer, it is festival season! All over the world people are gathering around either a feeling, or a musical style, a piece of cultural heritage or something completely different – it doesn’t matter in the end, what’s important is to get together. What I plan to present below are three examples of festivals colorful enough to be memorable, but as relaxing as to play microgaming slot machines online at www.allslotscasino.com. Here we go. Maybe not exactly a festival, but rather a parade, but it is a memorable one nonetheless. Boi Bumba (which roughly translates to “beat the bull” is a story about Mae Catarina, a pregnant woman who has strong cravings for beef tongue. She asks her husband, Pai Francisco, to do something to chill her cravings – and he decides to steal the Boi (a prized ox) from a wealthy farmer. The crime is revealed, Francisco is arrested, but with some magic the happy ending is finally reached. The story might not be as intricate as some modern Hollywood movies, but its presentation makes it worth your while. Giant puppets, costumed performers, huge parade floats participate in the stage performance of the magical folk tale. It is a grand and memorable spectacle. Peruvians reach back to their roots with the Inti Raymi, a nine day parade celebrating the Inca god Inti in the city of Cuzco. Being in the Southern hemisphere, Peru is at the middle of winter at this time (not that the temperatures would indicate it). 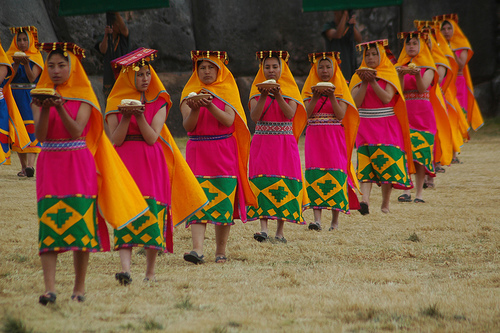 Inti Raymi celebrates the winter solstice, and involves lavish banquets, music and dancing, costumes and re-enactment of ancient Inca rituals dedicated to the Sun God Inti. Worshiping the Sun does not only mean baking on the beach, I presume. Said to be the world’s oldest annual sporting event, the oil wrestling festival in Edirne is the ultimate display of machismo and testosterone. Dozens of pehlivan (wrestlers) gather for Kirkpinar from all around Turkey, dressed in nothing but a pair of traditional trousers called “kisbet” and covered in olive oil to fight one on one with nothing but their skills and bare skin on them. The origins of the Kirkpinar festival date back to the 14th century. The – somewhat fairy tale like – legend says that 40 soldiers started wrestling near modern day Edirne to fight off boredom. Two of them were so good that they fought for the whole night until they both died. They were buried under a fig tree, and the next year a source of clear water around the same tree.